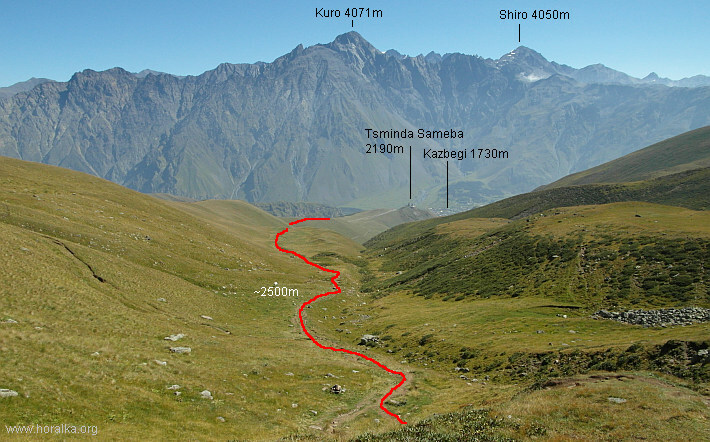 Startpoint of the climb is village Kazbegi (1730m), laying on an important road connecting Tbilisi and Vladikavkaz in Russia. Public transport from Tbilisi usually takes around 3 hours. 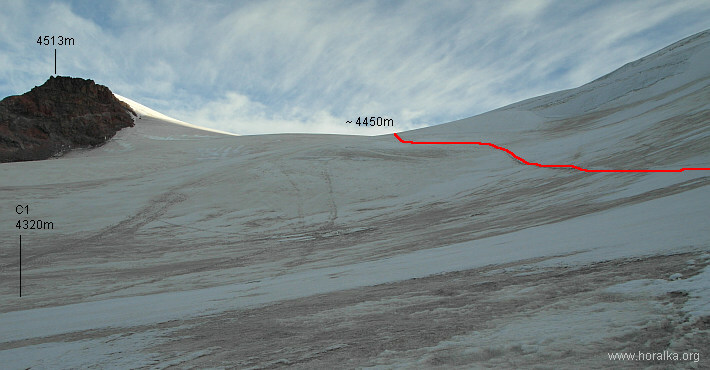 The normal route from Georgia is not very demanding technically - comparable to average fourthousanders in f.e. Swiss Alps. 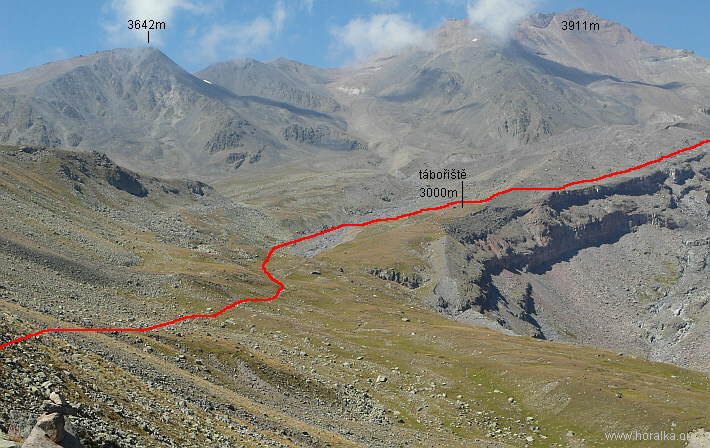 Demanding is the overall lenght of the climb, height difference (start point is only at 1730m) and of course the summit height of over 5000m. 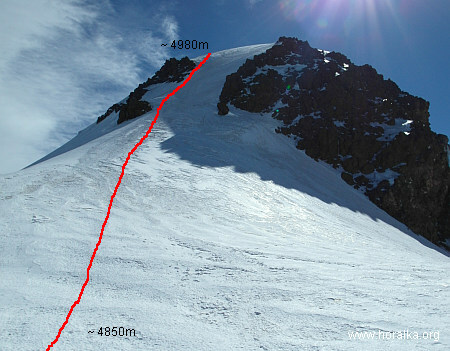 What can make the climb really strenuous is weather, which changes here very fast and lot of people fail to summit the mountain because of that. 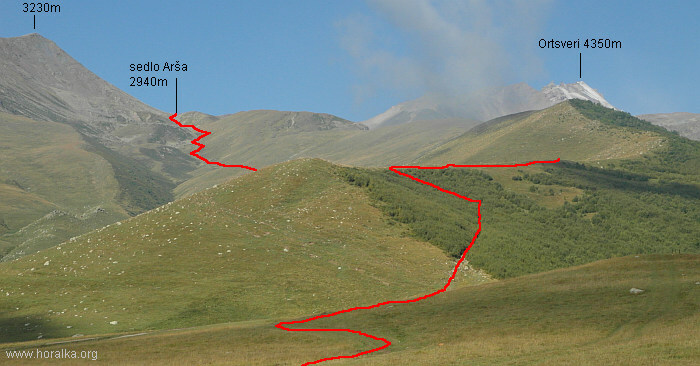 Overall grade of the normal route is PD (sometimes also graded PD+). 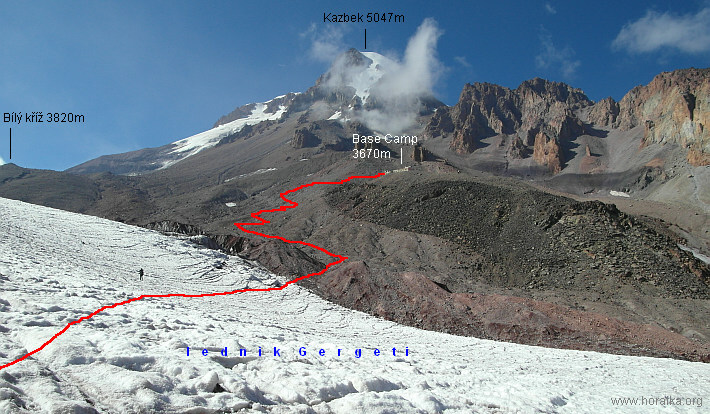 Under usual summer conditions, the standard glacier gear is enough to handle the climb - crampons, ice axe, rope, harness... A warm, windproof clothes is a must - the mountain is a lone stander and attracts gale winds, which can pull the temperature below -20C, even on a sunny summer day. 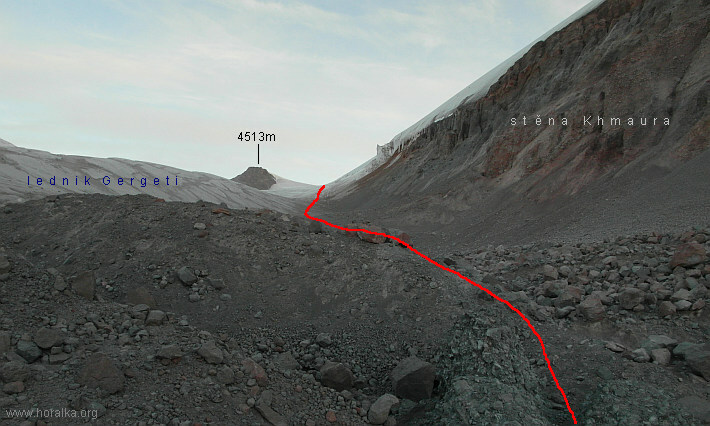 Trekking poles and ski goggles makes sense to carry (as protection from blown volcano dust around the Khmaura Wall, strong wind on the glacier...). 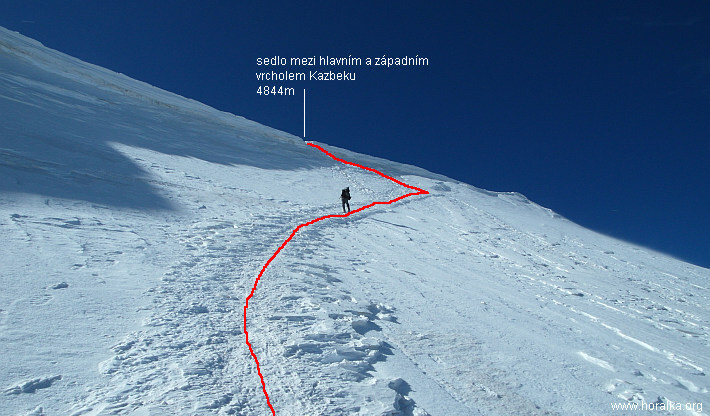 Ice screws would make sense to use only for the final steep slope (40 - 45 deg) below the summit - but the summer would have to be super hot to have the snow melted up there (we've been here in September, summer was warm and only few small spots with blank ice). 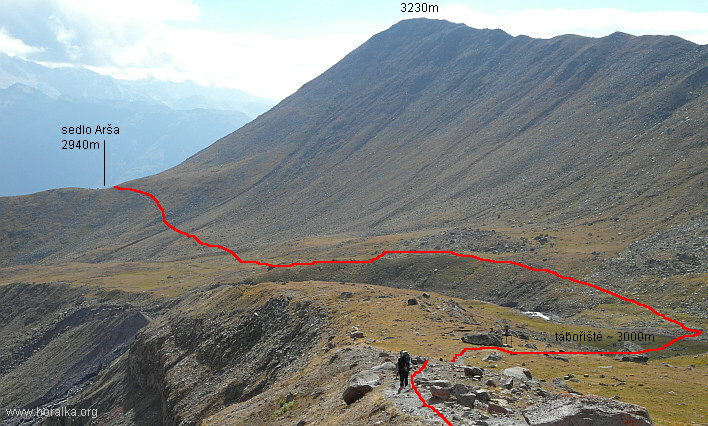 Potable water is rather scarce along the normal route. 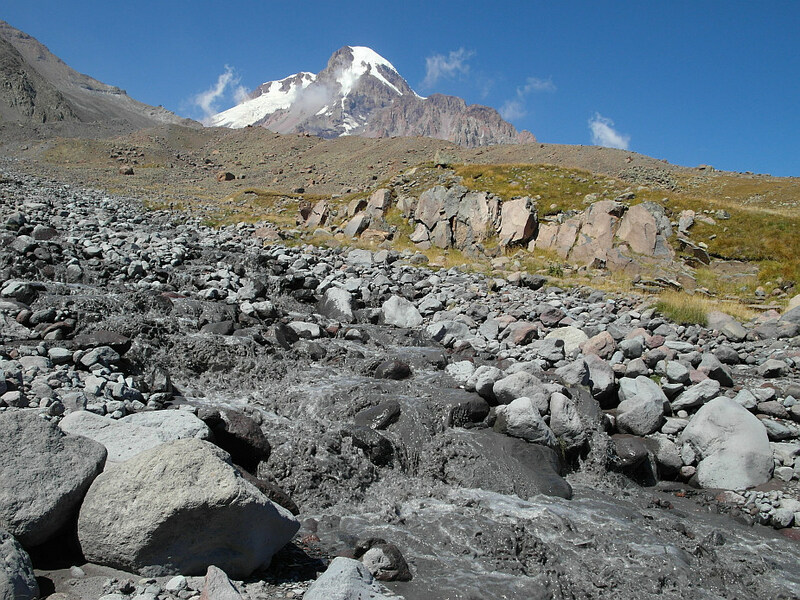 There is a spring next to the Tsminda Sameba Church (2190m), further there should be water source near camping place (2990m) behind Arsha Pass (however, in September 2012 we did not find any water source here). 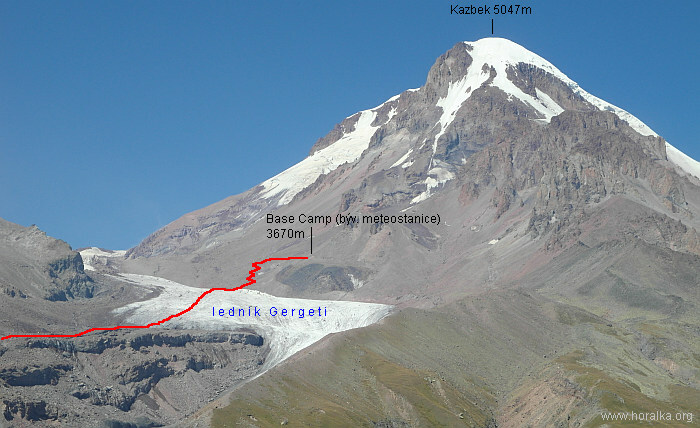 In the Base Camp at 3670m was possible to get water from a nearby ice field (boil the water or use water purifier). Alternatively, the hut warden sells bottles of water - 10 GEL / litre. 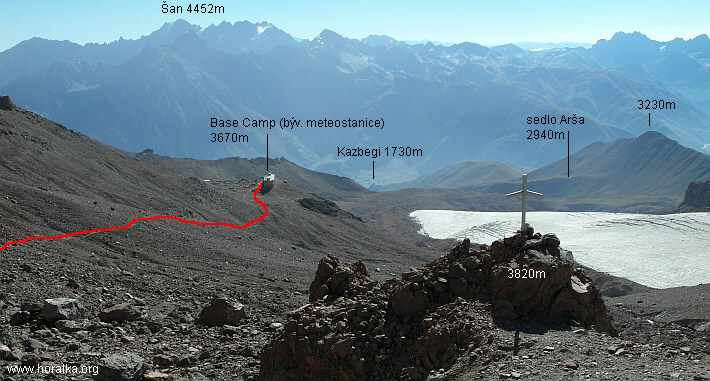 Above the BC, glacier, snow and gas stove are your friends. 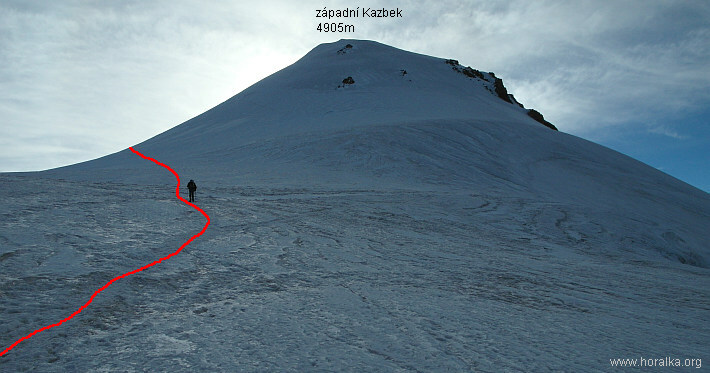 There are tons of options how to handle the climb via the normal route, but if you are not acclimatized, count with at least 4 full days to get to the summit and back to Kazbegi. Considering the relatively often bad weather, add another 1 or 2 days as a reserve. Below couple of usual itineraries. 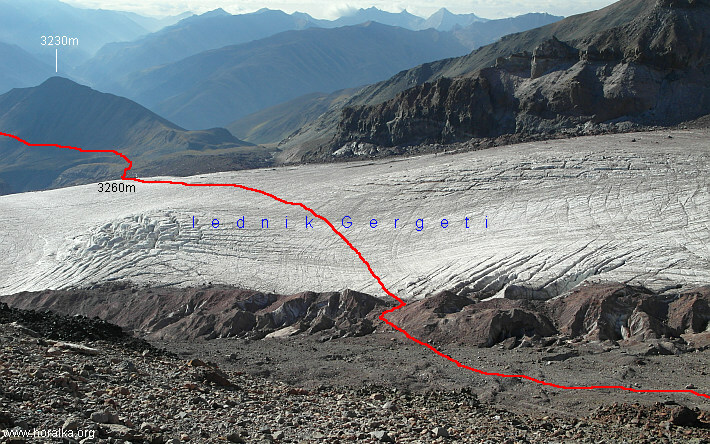 -	past the flag you leave the "white glacier" and step on the "dark glacier"
-	above app. 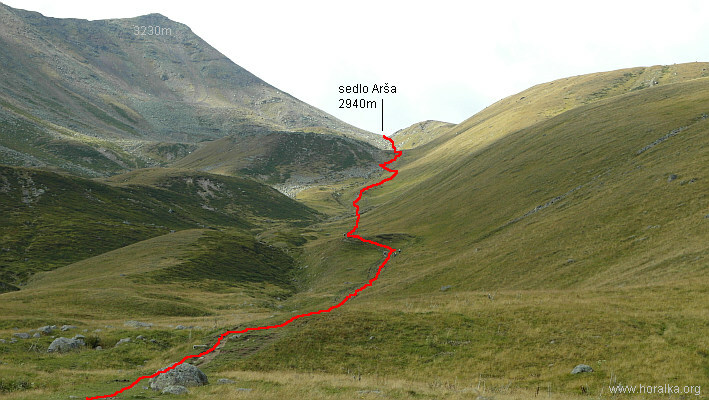 4100m the terrain is more "user friendly"